Actually, she saved two worlds, but who’s counting? Eighth Note takes you on a wild ride, after saving another world, Eva is at home and is feeling a little lost. She loves her husband and daughter, but feels as if her magic could be used for something else, something special. Cole Mathison, comes asking for help. He is also immortal, but he needs Eva to help him find out what really happened to the pop star who died. Eva and Cole start their journey together, neither has any idea what is in store for them, or what kind of dangers they will face. Or if they will be able to stop the string of suicides that seem to follow after anyone listens to the last song Nina was working on before ending her own life. While Eva places her life in danger to save countless others, she opens herself up to something that she might not be able to stop, even if she is an immortal. It will take more help than either Eva or Cole thought they would need. And when that helps arrives, can Eva keep them safe as well, or is she the one they should be worried about? Eva is trying to figure out who or what is now hunting her, she has kept so much of her own unhappiness bottled up that it has only given the evil that is haunting her more fuel in trying to convince Eva he is what she wants and needs. Eva, Cole, her husband Will, and her parents will have to work together relying on Eva’s magic to finally end this nightmare once and for all. I truly enjoyed this book, it has everything you could be looking for….all wrapped up in one fiery red head. There are parts that have you fanning yourself, sitting on the edge of your seat, wanting to make sure that noise you heard really isn’t anything to worry about (but almost being too scared to look), and a love story. What more can you want? 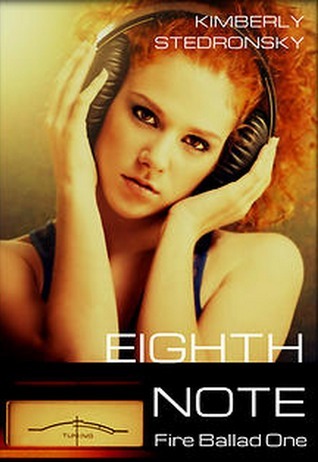 If you have read Kimberly’s Roam Series then you will get to more of those wonderful characters, but if you have not, Eighth Note is written to where you aren’t feeling lost, Kimberly is able to write Eva’s past in such a way, that when you read Eva’s story you can’t help but love her and her crazy red hair. Kimberly Stedronsky is an Ohio author who prefers an epic love story. 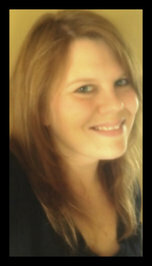 She is the writer of Paranormal, Horror, and New Adult Romance. Kimberly has a degree in Early Childhood Education, which she uses as an excuse to be as immature as possible on a daily basis. Married to a stand-up comedian Marine veteran, she always tries to find the humor in every situation. Their three children are appropriately sarcastic. Posted in Author Biography, Book Review, Links, Penny Pam, Synopsis. Bookmark the permalink.